Lightning strikes on the Shivling worshipped at the Bijli Mahadev Temple dedicated to Lord Shiva at Kullu in Himachal Pradesh, shattering it into pieces. The priest of the temple then applies freshly collected butter from the village with reverence and sincerity and sticks the pieces of Shivling together. The butter loses its melting point and the stone becomes one. Bijli Mahadev Temple, at an altitude of 2460 meter, is located around 14 Km to the south-east of Kullu and a three Km trek from Mansari village. It is said that the Shivling worshipped at Bijli Mahadev Mandir gets damaged due to lightning every year in Shravan month – the temple priests then gathers the broken pieces and puts them together using butter. 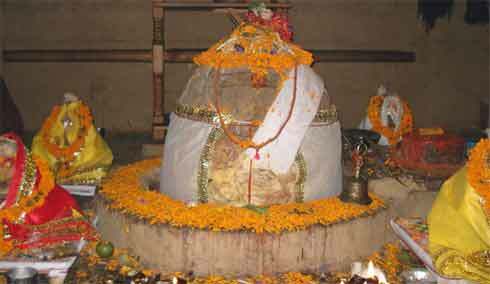 Therefore the name Bijli Mahadev Temple – Bijli means lightning. A local legend has it that the Shivling at the temple captures the powerful energies from the atmosphere and keeps the world safe. Every year lightening breaks the Shivling that is worshipped in the temple into pieces. Sometimes the pieces are scattered even outside the temple. These pieces are then collected by a little girl from the place. The recovered pieces are then put together by the temple priest who covers them with ‘Satto’ and butter. The Shivling is restored to its original shape and worshipped till another lightning breaks it.